The name for the U.S.S. Avalon comes from the legend of King Arthur. It is said that after Arthur fell in battle, three queens took his body by barge to the utopian island of Avalon, where they intended to heal the great King. Legend states that over Arthur's grave is written the words: "Here lays Arthur: the once and future king." CLICK HERE to read The Passing of Arthur, a poem by Alfred, Lord Tennyson. You’ll find Star Trek fans in every corner of the world where a television screen is available. The franchise has developed a massive following over the years and the fan base grows as each new generation discovers the vision of Gene Roddenberry. As a result, quite a few Star Trek fan clubs have been born along the way. The U.S.S. Avalon is based in Standish and belongs to Region 15 of Starfleet, the International Star Trek Fan Association. Over 4000 people are members in the worldwide organization, united in their appreciation for Star Trek. “My husband wanted to be involved in some sort of Star Trek fan club. Of the ones we came across, it seemed that Starfleet was the most organized. Everything seemed to be very well put together, so we looked for a chapter in our area," explains Tracy Andrews-Isquith, Chief Science Officer of the Avalon and public relations coordinator for the Starfleet region. 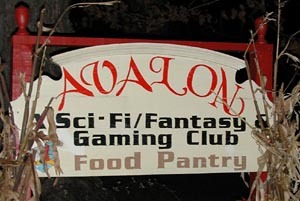 Like most chapters, the Avalon is united by a love for a wide range of sci-fi and fantasy subject matter. The group attends various sci-fi and comic book conventions, holds monthly pot luck dinner meetings, visits renaissance fairs, participates in fantasy swordplay with padded weapons and armor, and the list goes on. However, it's the group's dedication to serving the community that sets them apart from your average organization. Avalon's respect for the tenets of Star Trek serves as the foundation for their efforts. "What's the cornerstone of Star Trek? It's a better world, a better humanity," says Isquith. "The thing that brings us together in Star Trek is the quest or the yearning for that world, for that Star Trek world where humanity is taking care of itself and each other." The Isquiths have established a food pantry in their home where local citizens in need can visit each Sunday to pick-up an allotment of goods. The group also participates in the Coats for Kids project, the annual Multiple Sclerosis walk, and has adopted a US Military base in Germany for the Overseas Coupon Project. "Soldiers overseas and their families don't qualify for food stamps -- a private hardly makes any money at all. If they were stationed in the US, their families would probably qualify for services, like food stamps and general assistance that they don't qualify for overseas. So, the PX (the on-base store) participates with the overseas coupon project to take coupons (that can be up to 6 months expired) to help the families." Some members of the U.S.S. Avalon enjoy a monthly pot luck dinner before their meeting begins. With the holiday season just around the corner, the U.S.S. Avalon is getting ready for their annual Christmas wrap at Borders in South Portland on December 9th (1pm - 6pm). The crew dresses up in full Star Trek uniform and wraps gifts in return for donations. Proceeds go towards gifts for residents of Portland's Peabody House, a residential treatment facility for people in the advanced stages of HIV. "In the past, we've done 4 maybe 6 days worth of fundraising, and it had been our biggest fundraiser of the year," says Isquith. There's also an affiliate group within Starfleet, called the Starfleet Marine Corp. This Starfleet offshoot works closely with the United States Marine Corp every year to assist the Toys for Tots Foundation. While the Starfleet fan association does not have a mandate requiring charitable acts from chapters, this spirit of giving and philanthropy is not uncommon for its members. "I think the people who I've met throughout the region are very giving, motivated people. I think overall, we have a good blend of people who are head over heels for the whole fandom thing and are good people who just want to help out. That's what I've seen."